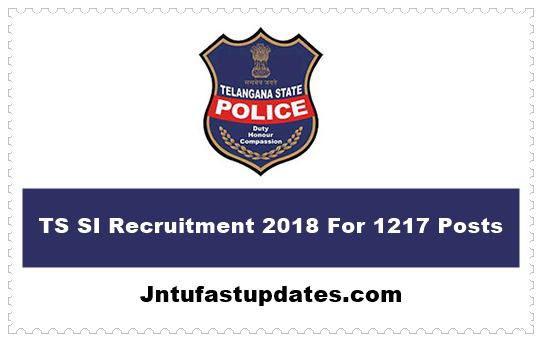 TS Police SI Recruitment 2018: TSLPRB has released Telangana SI Recruitment Notification For 1217 Sub Inspector of Police (Civil, AR, SAR CPL, TSSP), Station Fire Officer, Deputy Jailor & Assistant Matron Vacancies through ONLINE mode. Eligible Candidates can apply online for Telangana Police SI Posts on Website www.tslprb.in from 09-06-2018 to 30-06-2018.
i. For the Post Code Nos. 11 to 15: Must have attained the age of 21 years and must not have attained the age of 25 years as on 1st July, 2018 i.e., must have been born not earlier than 2nd July, 1993 and not later than 1st July, 1997. However, the Government of Telangana vide GO Ms No. 62, Home (Legal) Department dated 06-06-2018 have raised the upper age limit prescribed for appointment by direct recruitment by Telangana State Level Police Recruitment Board to various Posts in Police Department, Disaster Response & Fire Services Department, Prisons & Correctional Services Department and Special Protection Force by 3 (three) years. This relaxation is in addition to the upper age limit as mentioned above. ii.For the Post Code No. 17: Must have attained the age of 18 years and must not have attained the age of 30 years as on 1st July, 2018 i.e., must have been born not earlier than 2nd July, 1988 and not later than 1st July, 2000. However, the Government of Telangana vide GO Ms No. 62, Home (Legal) Department dated 06-06-2018 have raised the upper age limit prescribed for appointment by direct recruitment by Telangana State Level Police Recruitment Board to various Posts in Police Department, Disaster Response & Fire Services Department, Prisons & Correctional Services Department and Special Protection Force by 3 (three) years. This relaxation is in addition to the upper age limit as mentioned above. iii. For the Post Code No. 18: Must have attained the age of 21 years and must not have attained the age of 30 years as on 1st July, 2018 i.e., must have been born not earlier than 2nd July, 1988 and not later than 1st July, 1997. However, the Government of Telangana vide GO Ms No. 62, Home (Legal) Department dated 06-06-2018 have raised the upper age limit prescribed for appointment by direct recruitment by Telangana State Level Police Recruitment Board to various Posts in Police Department, Disaster Response & Fire Services Department, Prisons & Correctional Services Department and Special Protection Force by 3 (three) years. This relaxation is in addition to the upper age limit as mentioned above. iv. For the Post Code No. 19: Must have attained the age of 21 years and must not have attained the age of 25 years as on 1st July, 2018 i.e., must have been born not earlier than 2nd July, 1993 and not later than 1st July, 1997. However, the Government of Telangana vide GO Ms No. 62, Home (Legal) Department dated 06-06-2018 have raised the upper age limit prescribed for appointment by direct recruitment by Telangana State Level Police Recruitment Board to various Posts in Police Department, Disaster Response & Fire Services Department, Prisons & Correctional Services Department and Special Protection Force by 3 (three) years. This relaxation is in addition to the upper age limit as mentioned above. Hello sir please help me in getting of si result 2018. It can't show in tslprb site. Please guide me sir how get si result. Sir plz extend the date for applying the post as so many candidates are not applied due technical issues of payments and in some cases the candidates have paid fee but application form not appeared… So plz extend the date for a couple of days. So that they can be apply for above post. Plz consider our request and extend the date. Thanking you sir.. I am select ex service man opcion "Yes" but I am not ex service man so placed change opcion "No"
Please change my ex _serives opcion select "Yes" but I am not ex service man so place change opcion "No"
sir please change my preliminary examination language to TELUGU.